We are here to answer all your questions about the Harvard Varsity Club. Trust us, we've heard them all. As an independent 501(c)(3) non-profit organization, ~33% of our operating budget comes from annual, tax-deductible dues and donations. Q: What is the Harvard Varsity Club? A: The Harvard Varsity Club (HVC) is a group of undergraduate student-athletes, alumni, parents, and friends who have operated under the mission of preserving the traditions, fostering the ideals, and advancing the interests of Harvard Athletics since 1886. With more than 2,000 active members around the globe, we are Harvard’s largest affinity group. Q: But what does the HVC do? Career Services: The HVC provides professional development assistance and networking opportunities to student-athletes and young alumni in the form of individual conversations, team presentations, employer open houses, industry nights, a Career Fair, a Women’s Leadership Panel, the Athlete Medical Mentorship Program, and a job & internship board to name a few. Community Building: The HVC brings all student-athletes together under one roof at events like the Senior Letterwinners’ Dinner and Welcome Back BBQ, and hosts events around the country that allow alumni, parents, and friends to remain engaged with the Harvard Athletics community. We also provide assistance to those in our community who need it the most through the Benson M. Abercrombie ’21 Fund and Michael Vollmer ’90 Fund. Preserving Traditions: The HVC has been preserving the traditions of Harvard Athletics since 1886. The most prominent examples are the Susan and Cory '90 Thabit Varsity Lettersweater Program, Senior Letterwinners' Dinner, HVC Hall of Fame, and the H Book series chronicling the history of Harvard Athletics. Friends Group Support: The HVC provides fundraising, stewardship, volunteer, and event management support to Harvard’s 24 Friends and Special Interest Groups. In a typical year this means that we will assist in hosting more than 80 Friends events, managing roughly 200 volunteers, and sending thousands of emails -- all while helping the Friends Groups meet their individual fundraising goals. Q: I thought this was Your Team for Life. How can my membership expire? A: The HVC is an independent 501(c)(3) non-profit. Like most non-profits, we depend on the financial support of annual, dues-paying members to ensure that we not only provide the quality of programming that our student-athletes, alumni, and friends have come to expect of us, but that we can also grow the scope of programming we offer. Memberships become active and expire on a rolling basis. They run for 1, 3, or 5 calendar years -- depending on which level you select -- from the date we receive your dues. We also offer Lifetime Memberships, but we’ll get to those in a moment. Q: I already donated to my Friends Group. Why should I also become a member of the HVC? A: The HVC works with your Friends Group, but we are not your Friends Group. The HVC is its own separate entity and we provide the Friends with specific services. As such, our funding is greatly dependent on the generosity of our alumni and friends who make the commitment to support both us and their Friends Group. Becoming a member of the HVC is an investment in the past, present, and future of Harvard Athletics. As a member you will be enhancing the educational and social experiences of our 1,200+ undergraduate student-athletes, strengthening your relationships within the Harvard Athletics community, and ensuring that some of the greatest traditions in collegiate athletics live on -- where do you think your Varsity Lettersweater came from? In addition, you will receive discounts on HVC events and merchandise -- including new Varsity Lettersweaters and DHA sweatshirts to replace those well-worn items in your drawer -- a subscription to our e-newsletter, News & Views, and access to our member database. Q: Are my annual dues tax deductible? A: Great question, and YES! Your annual dues and any additional donation you may make to the HVC are 100% tax deductible. We will provide you with a tax receipt for your records. Q: OK, you’ve sold me. How do I submit my annual dues? A: That’s wonderful news, we couldn’t be happier to have you on our team. You can submit your annual dues online here, send a check made out to the Harvard Varsity Club to 65 North Harvard Street, Mur Center, Boston, MA 02163, or you can call our office at 617.495.3535 Monday through Friday between 9AM and 5PM EDT. Q: I'm having trouble using my Harvard Key. What do I do? A: The Harvard Key system can be tricky, we know, but its all done in the name of cyber security. Luckily the HAA has some helpful tips for alumni. ​Unfortunately parents and non-alumni cannot use their Harvard Key on our website. You will need to create a new account. Q: How else can I be helpful? Bringing your family and friends to an HVC event. Our upcoming schedule is available online here. Opting-in to our Career Services Networking Database. Click here for instructions. Joining our online community on LinkedIn, Facebook, Twitter, and Instagram. Q: I want to make a long-term commitment. What can I do? A: Become a Lifetime Member. HVC Lifetime Memberships provide permanent funding for the HVC through an endowment which lessens our dependence on annual dues and donations. 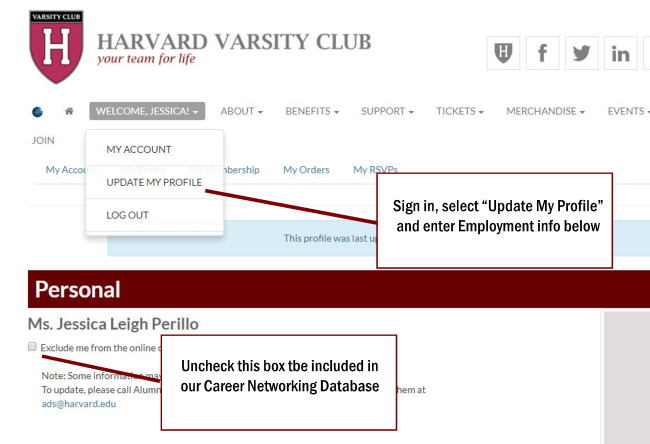 As a Lifetime Member you will gain priority access to HVC events and high-demand Harvard Athletics events, and will have your name emblazoned on the next Lifetime Member plaque -- there’s no easier way to get your name on a Harvard building! We now have more than 400 Lifetime Members. View their names here and see which of your classmates have made the commitment. Q: Can I receive Class or Reunion Credit for my Lifetime Membership? A: Another great question, and YES again! You can allocate a portion of your Harvard College Class or Reunion gift/pledge to the HVC, or you can make a one-time, fully tax-deductible gift of $5,000 to the HVC through the Harvard College Fund.